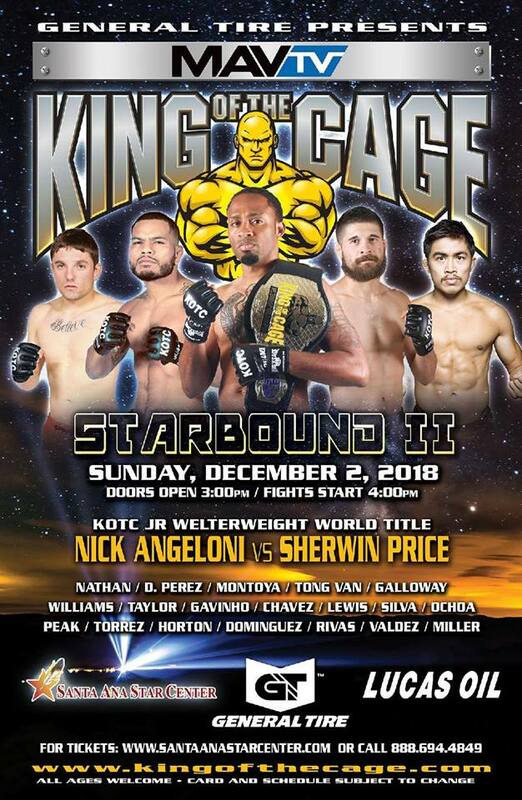 End your weekend with local mixed martial arts as King of the Cage presents Starbound II on Sunday afternoon (not Friday or Saturday) with the first fight scheduled to begin at 4:00pm. Reserve seating and Ringside tickets are on sale now. For more information or to purchase tickets, please visit www.santaanastarcenter.com or call 888.694.4849, or if your favorite fighter on the fight card still has tickets swoop those up from them to support the locals who work hard to sell tickets. The main event for the evening features FIT NHB’s Sherwin “The Genius” Price (5-0) defending his KOTC World Jr. Welterweight Title (160-pounds) against fellow undefeated fighter, Nick “The Italian Stallion” Angeloni (3-0). Price has been a rising prospect amidst the ranks of New Mexico martial artists and will put his unblemished record to the test against the Alliance MMA trained athlete. In the co-main event, Derek Perez of Belen’s Perez Fighting Systems will look to capitalize on his successful 2018 that has included capturing a bare-knuckle fighting title as well as notching a win over a prominent boxing prospect on less than-a-day notice. Perez will battle Nikko Nathan of Force of 1 Martial Arts in Clovis, NM. The bout will be contested in the 155-pound lightweight division. Derek’s brother, Gene Perez will battle Santa Fe’s Joshua “The Destoya” Montoya in a 135-pound tilt that will pit two veterans of New Mexico combat sports against the other in a stylistic clash between grappler vs. striker. The fourth feature fight matches FIT NHB’s Turrell “Freakstrong” Galloway Marc TonVan which is to be competed in the 125-pound weight class. Other fighters advertised for the event include: Charlie Williams, Terry Taylor, Evan DeLong, Luiz Gavinho, Bill Albrecht, Jon Sparks, Ozzy Chavez, Sarina Ochoa, Meaghan Penning, Francisco Dominguez, Chris Rojas, Kemoy Anderson, Sterling Peak, Nathan Torrez, Thomas Horton, Andre Mitchell, Jerry Gutierrez, Dominic Yara, Ty Miller, Billy Ray Valdez and Austin Lewis. As is the case for any event, the event and card are subject to change. If you are using your social media to discuss the event the promotion’s official hashtag is #Starbound2.